“God Mode” is a cute name for an otherwise mundane search listing of the various options in Control Panel. Having all the features displayed in Windows Explorer eliminates searching through the menus and offers a real convenience. The different ways of showing the results in Windows Explorer are another benefit of “God Mode”. This tool is actually very simple and does not take up much space. You need to create a folder in the boot disk of your computer. The common name for this is “Local Disk (C:)”. The new folder has to have a special name. The name can start with any word you like, but the part below, starting with the period, must be as shown. Select the next line shown here and copy it to the clipboard by pressing Ctrl+C. Open Windows Explorer – click the “Windows Explorer” icon in the Taskbar. 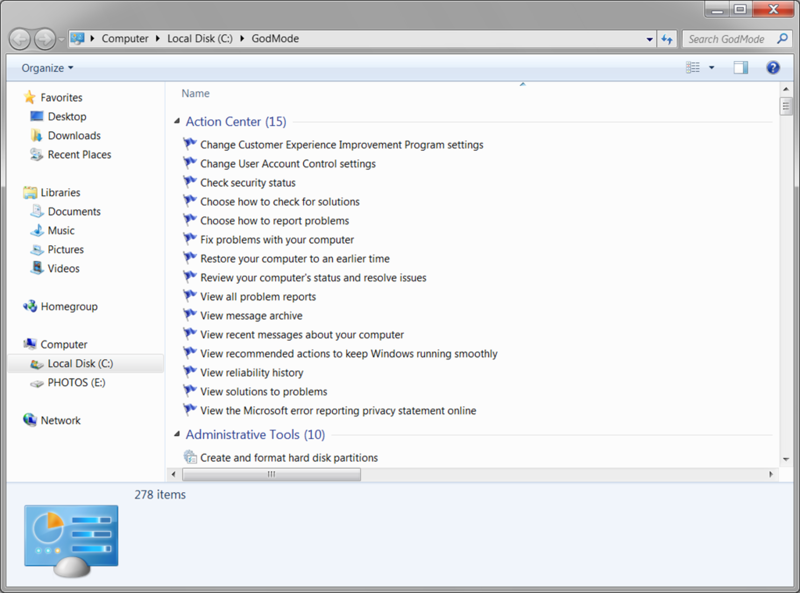 In the navigation panel, below Computer, click Local Disk (C:). You may have to expand the Computer listing by clicking the arrowhead symbol in front of it. Click New folder in the menu bar. Press Enter to complete the naming process. The folder name will display as “GodMode” and be prefixed with the Control Panel icon. To make this feature even more easily accessible, place a shortcut icon on the desktop. Right-click the GodMode folder, move the pointer down to Send to, then to the right and click Desktop (create shortcut). Here in one long listing you have all the control functions with good descriptive names. On my computers I get 278 items listed – more than I ever want to use, but, het, this is computing power. All the display features of Windows Explorer are, of course, available to make getting around in this list even easier. How do I create desktop shortcuts in Windows 8? How do I move a sub-folder up a level? How do I import photos from my camera to my Windows 7 computer? How do I pin Outlook to the taskbar in Windows 8?